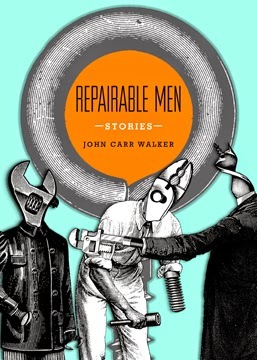 In his debut collection, Repairable Men, John Carr Walker offers ten portraits of modern manhood. Presented in another beautifully designed book from Sunnyoutside Press, Walker’s men are imperfect, and their stoic exteriors often mask anxieties and vulnerabilities they themselves are struggling to understand. These are not men in touch with their feelings; rather, they stumble through their days, blindly wrestling their demons, battles that often leave them battered, confused, yet sometimes, closer to grace. Complicated love—one finds it in abundance in these stories. Or perhaps the love is less complicated than its expressions, the imperfect words we offer one another, the gestures too little or too late. One of the rewards of reviewing is the discovery of new voices. Walker’s style is solid and his focus is keen. He peels back layers in a series of well-paced and precise observations, and by the end of many of these stories, we feel as if we’ve been on a journey of discovery, a journey not always comfortable but one that has led his characters closer to some kind of truth. Consider this final paragraph of “Candelario,” a story that examines how easy it is for a slighted man to turn to meanness and cruelty—and also how the grudges we hold can, if we’re not careful, end up defining us. Reviewer bio: Curtis Smith's latest book is Beasts and Men, a story collection from Press 53. In early 2015, Dock Street Press will release Communion, his next essay collection. In 2016, Aqueous Books will publish his next novel, Lovepain.